The impact of Mr. Mead’s philanthropy has literally changed the regional performing arts landscape. In addition to Arena Stage, The Studio Theatre, The Kennedy Center Millennium Stage, Signature Theatre, The Levine School of Music, The Atlas Performing Arts Center, and the Mead Theatre Lab at Flashpoint are just a few examples among dozens of area theatre and arts organizations which were able to realize dreams with the generosity and involvement of Gilbert Mead. An innately shy and unpretentious man, Gil Mead was transformed when he found himself on a stage – whether as a presenter, a performer, or with Jaylee, a frequent honoree for their myriad good works. His last public appearance on stage at the Helen Hayes Awards on April 16 of this year inspired the audience of 1800 to spontaneously rise to their feet in affection and appreciation. The crowd in turn was then treated to his ebullient signature two-handed wave. Before he emerged as one of the area’s foremost arts philanthropists, Mr. Mead enjoyed a 25 year career as an accomplished geophysicist at NASA’s Goddard Space Flight Center in Greenbelt. After his retirement from NASA in1987, he earned his J.D. law degree from the University of Maryland at Baltimore in 1991. At that time, he was the oldest individual ever admitted to the Maryland State bar. Mr. Mead took pride that his law work was provided primarily for friends in need. Rarely was there any charge for his services. Gilbert Mead was born on May 31, 1930 in Madison, Wisconsin to Dorothy and Stanton Mead. He was raised in Wisconsin Rapids, the headquarters of the family business, Consolidated Papers, Inc., run first by his grandfather and later his father. Along with his older brother George, he attended The Hotchkiss School in Lakeville, Connecticut where he developed a great love and aptitude for physics. Knowing his brother was the logical choice to succeed their father, he chose instead to pursue a degree in physics from Yale University which he earned in 1952. He proudly served on the board of Consolidated Papers, Inc. from 1974 until 2000, when Consolidated was sold to a Finnish company, Stora Enso. In addition to his professional endeavors, two further momentous events occurred while at Goddard: Mr. Mead met his second wife Jaylee whom he married in November of 1968; and he joined the Goddard amateur theater group, MAD (Music And Drama club), where he developed an enduring love of the theatre. Mr. Mead frequently music directed their productions in which Jaylee often had starring roles. In the 1980’s Mr. and Mrs. Mead began attending Washington professional theatres. They were so inspired and enlivened by the quality and vitality of the artistic community that they not only changed their residence from Greenbelt to the District, but embarked on a journey of unparalleled arts philanthropy. Both Mr. and Mrs. Mead wanted to instill within the next generation of family a tradition of giving, encouraging them to give where they live. In 1989 they founded The Gilbert and Jaylee Mead Family Foundation, now known as the Mead Family Foundation. Mr. Mead’s children Betsy, Diana, and Stanton, along with their mother Marilyn, are all actively involved in the Foundation. The Foundation grants approximately $1 million annually, primarily in support of children and their families in the District of Columbia and Montgomery County, Maryland. 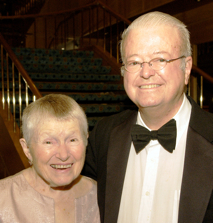 As a result of their personal dedication to the performing arts, Mr. and Mrs. Mead have been jointly honored with several awards including the Washington Post Award for Distinguished Community Service, the Cultural Alliance Patrons of the Arts Award, the Mayor’s Arts Award for Excellence in Service to the Arts, and were named 1999 Washingtonians of the Year. In recent years, both Mr. and Mrs. Mead felt strongly to give while they live so they could enjoy those efforts they were able to personally support. Along with this new level of participation, they continued to provide board service and friendship to theatres of all sizes. Mr. Mead’s philanthropy was not limited to Washington, but came to include a life-changing commitment to his hometown of Wisconsin Rapids. For almost 100 years the family business, Consolidated Papers, Inc., was the epicenter of Wisconsin Rapids economy and culture. When Consolidated was sold to Stora Enso in 2000, its headquarters was transferred to Finland and soon after, the plant’s employment base was reduced by 40%. Gilbert Mead became deeply concerned about the impact of the sale on the community where he grew up. His involvement began simply - by providing a Steinway piano for a new performing arts center. On a tour of the new center he asked if they had a performance-quality piano. “I can help with that” he offered, “In Washington I’m known as the piano man.” But with the inspiration of his cousin Ruth Barker, encouragement from his wife Jaylee, and collaboration with the local Community Foundation, Gilbert Mead set forth to help the citizens of Wisconsin Rapids embrace the changes affecting their community and take ownership of their future. A dramatic and overarching Community Progress Initiative – of which Mr. Mead was a principal engineer – not only yielded a new outlook for the people of this central Wisconsin town – but produced new community infrastructure, countless new jobs, matching grants for 42 local non profit community endowments, The Barker Mead Resource Center for community and non profit Organizations. Additionally, Mr. and Mrs. Mead spearheaded a fundraising effort for the Wisconsin Rapids Community Theatre. In a 1997 Washington Post profile, Mr. Mead confessed "I guess I realized that you can have wealth and not be ashamed of it, and that you ought to use it in a constructive, useful manner, not just to enhance your own lifestyle." He traveled the world with his wife, was an accomplished pianist, and sung with the award-winning Alexandria Harmonizers Barbershop Chorus and The Washington Chorus. In addition to his wife Jaylee Mead, survivors include two daughters, Betsy Mead of Rockville and Diana Mead-Siohan of Palm Coast, Fla.; his son Stanton W. Mead, II of Middletown; five grandchildren; his brother George W. Mead II of Wis. Rapids, Wis., his sister Mary LaMar Price of Madison, Wis. and his first wife, Marilyn K. Mead. Mr. Mead was preceded in death by another son, Robert, who died in 2002.